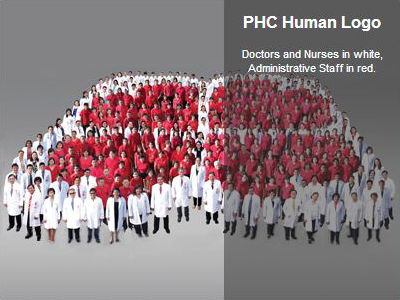 Doctors and Nurses in white, Administrative Staff in red. 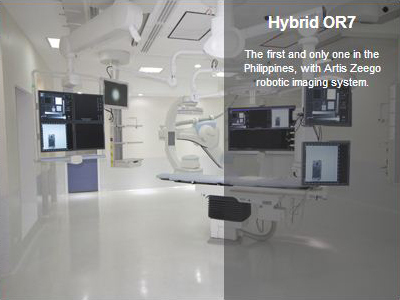 The first and only one in the Philippines, with Artis Zeego robotic imaging system. 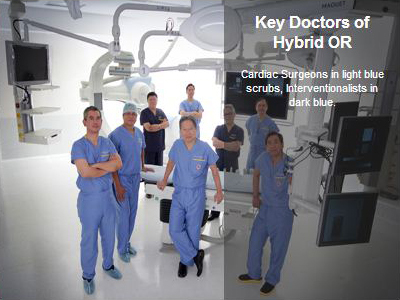 Cardiac Surgeons in light blue scrubs, Interventionalists in dark blue. 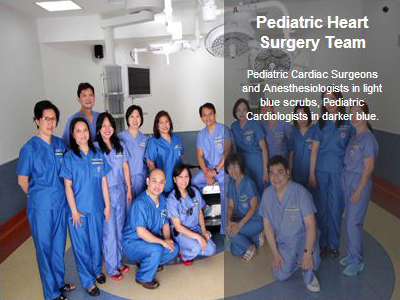 Pediatric Cardiac Surgeons and Anesthesiologists in light blue scrubs, Pediatric Cardiologists in darker blue. 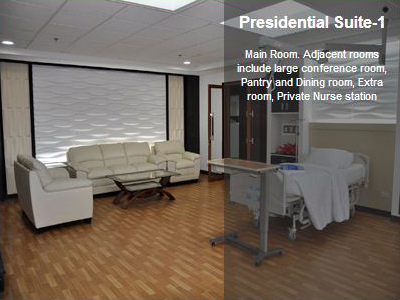 With ambient lighting system to make a warmer, more comfortable environment for patients. 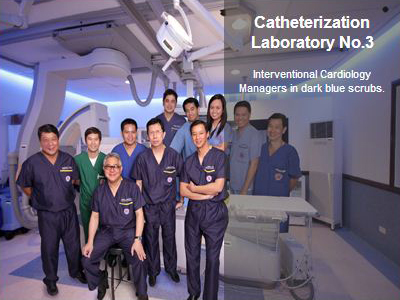 Interventional Cardiology Managers in dark blue scrubs. 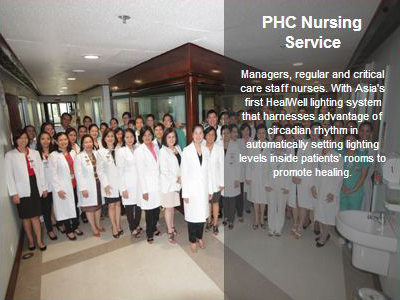 Managers, regular and critical care staff nurses. 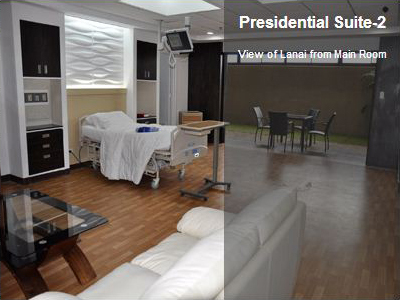 With Asia's first HealWell lighting system that harnesses advantage of circadian rhythm in automatically setting lighting levels inside patientsâ€™ rooms to promote healing. 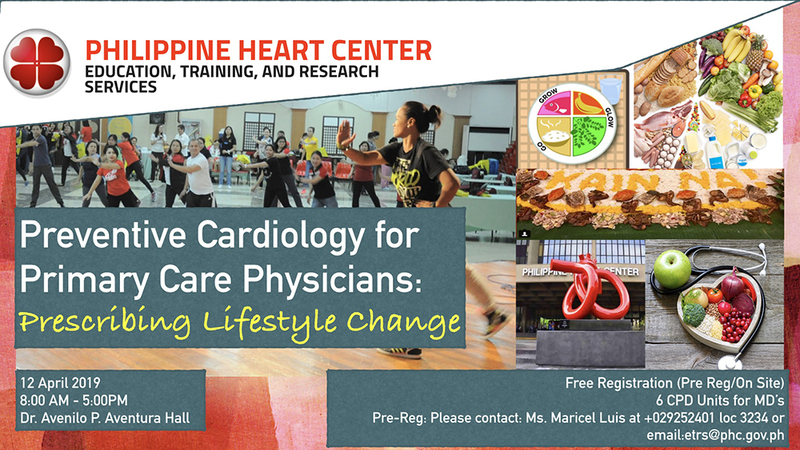 The Division of Preventive Cardiology under the Education, Training & Research Services will be holding a scientific forum, entitled:"Preventive Cardiology for the Primary Care Physicians: Prescribing Lifestyle Changes" on April 12, 2019 at Dr. Avenilo P. Aventura Hall. The registration is free (pre-reg or on-site)! 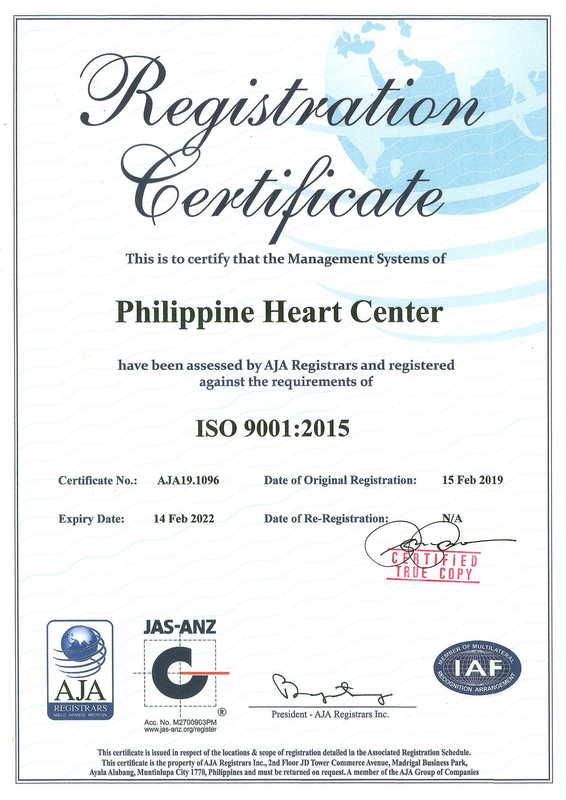 The Philippine Heart Center received the ISO 9001:2015 Certification from the Anglo Japanese American (AJA) Registrars thru its Managing Director/President, Mr. Paul B. Bagatsing, during the PHC Employees Program on February 28, 2019, in celebration of the 44th PHC Anniversary. 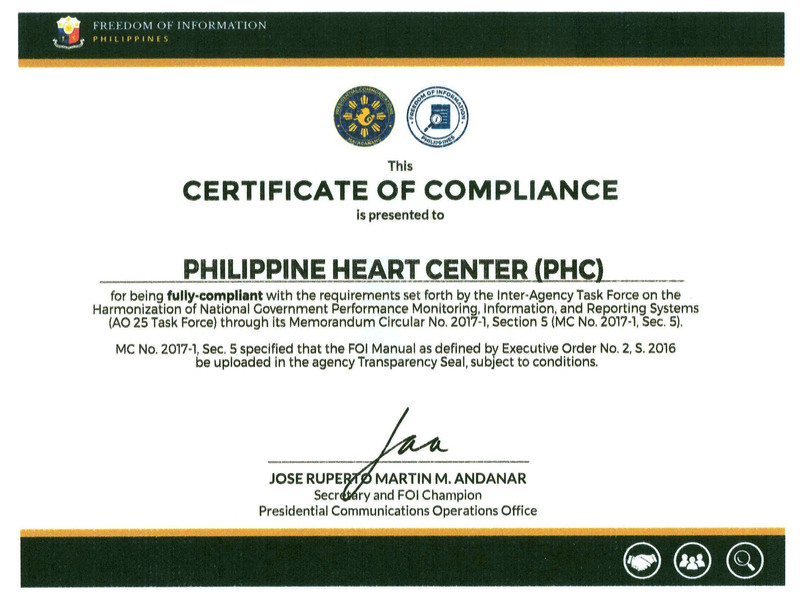 Dr. Joel M. Abanilla, PHC Executive Director, was present to receive the testament of the latest milestone of the PHC. 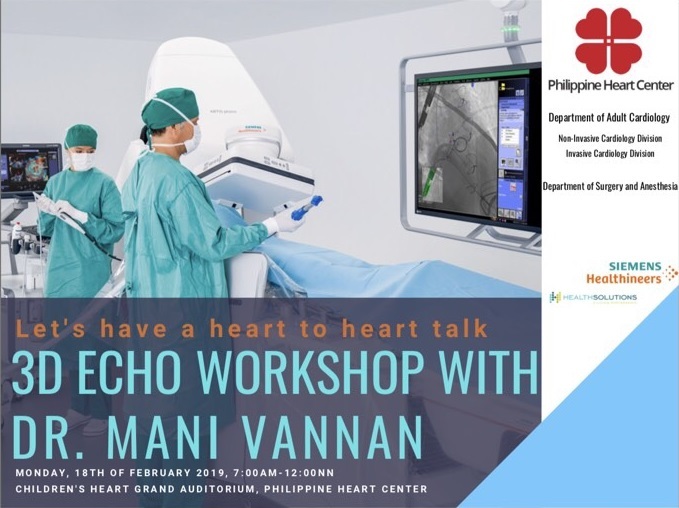 The Philippine Heart Center will hold the 3D TEE in Transcatheter Aortic Valve Replacement (TAVR), a 3D Echo Workshop, on 18 February 2019, 7:00 am to 12:00 nn, with Dr. Mani Vannan, Co-Chief of the Structural abd Vascular Center of Excellence, Piedmont Heart Institue in Atlanta, Georgia, as Guest Lecturer. 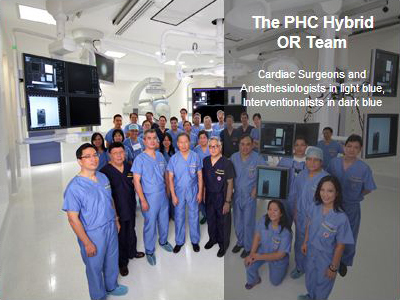 Highlight of the event is an actual TAVR Procedure to be beamed via live streaming from the Hybrid OR, 2nd Floor of the Hospital Bldg., to the PHC Childrenâ€™s Heart Foundation Grand Auditorium, 3rd Level of the Medical Arts Bldg. Annex. 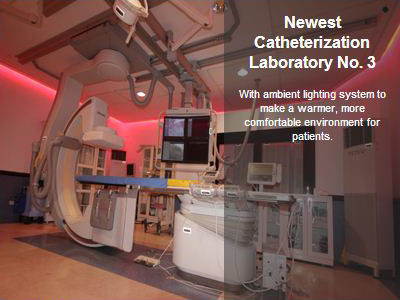 The Workshop is organized by the Non-Invasive Cardiology Division together with Invasive Cardiology Division, Department of Adult Cardiology, and Department of Surgery and Anesthesia. 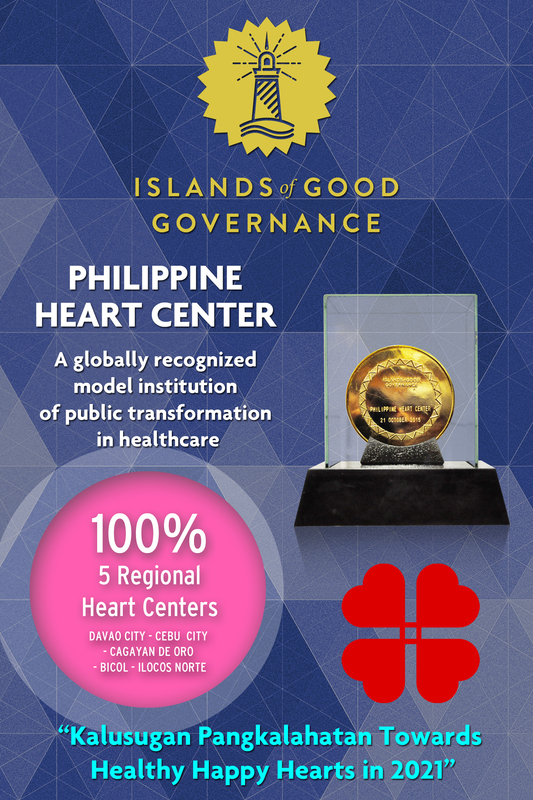 The Philippine Heart Center marks its 44th Anniversary on February 14, 2018. 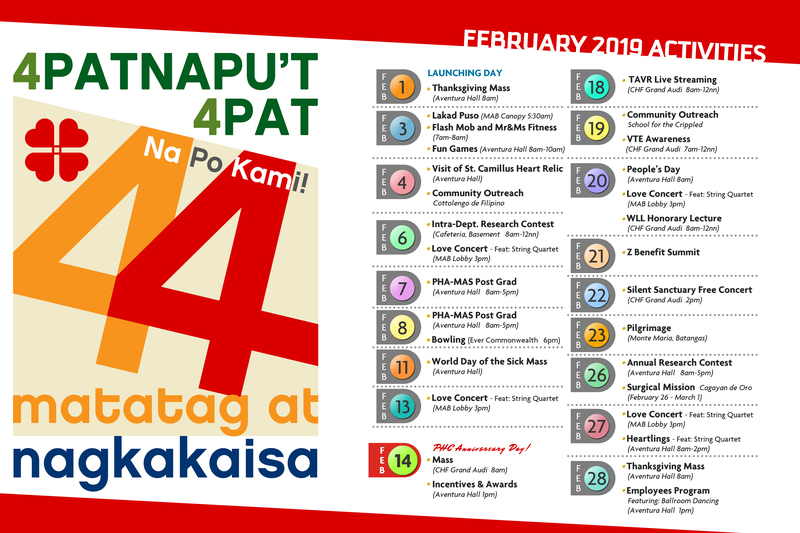 The month-long celebration with the theme "Apatnapuâ€™t Apat Na Po Kami! Matatag at Nagkakaisa" starts with a Eucharistic Celebration on February 1. On February 3, the annnual Lakad Puso and Family Fun Day will be held. 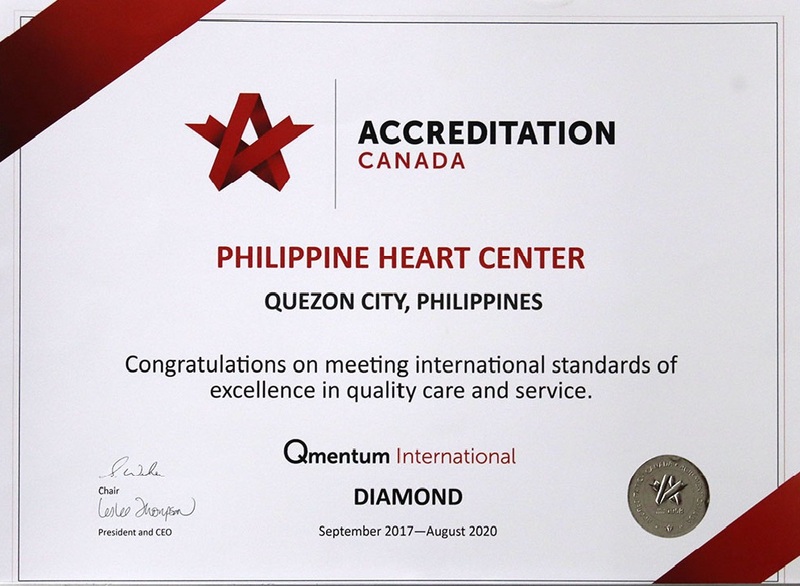 Other activities such as the PRAISE Awards, People's Day, Scientific Symposium, Community Outreach/Free Clinic, Pilgrimage, Love Concert, and the Employees Program have been lined up until the end of February. 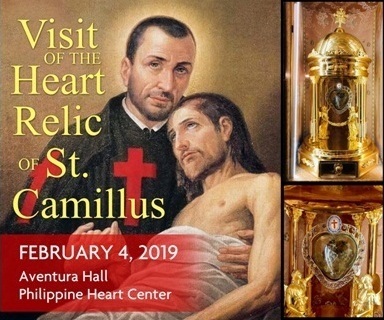 The Philippine Heart Center will be the second stop of the Incorrupt Heart Relic of St. Camillus de Lellis when it makes its second visit to the Philippines starting February 2, 2019 and will stay for two (2) months. 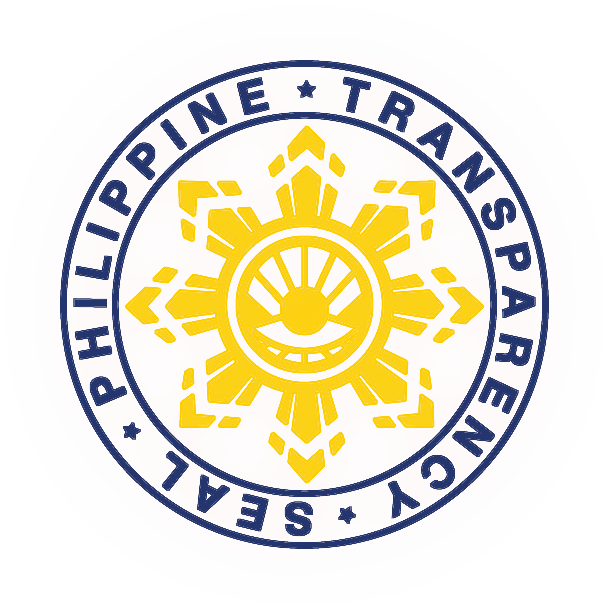 It is scheduled to be brought around our country and visit several Churches and hospitals with the PHC hosting the Relic on February 4 for a Eucharistic Celebration at 10:00 am and the veneration that will follow up to 7:00 pm. 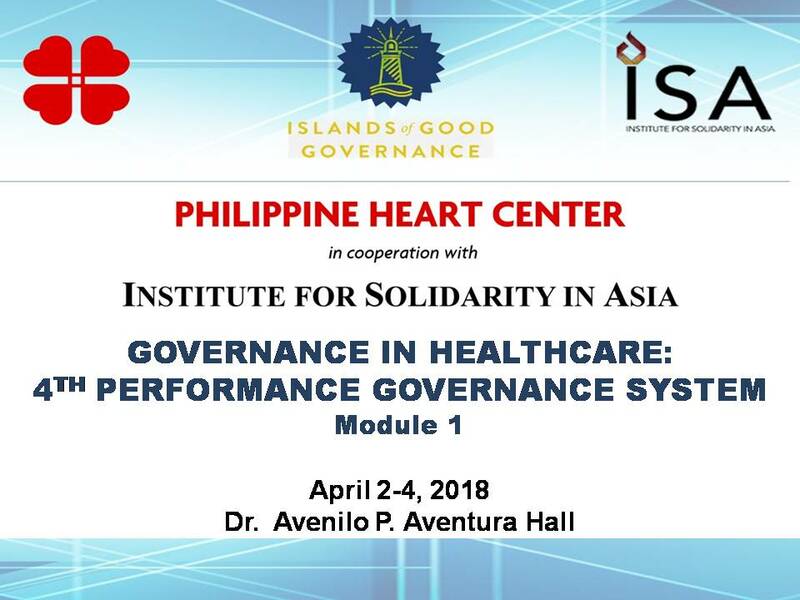 The Philippine Heart Center, in partnership with the Institute of Solidarity for Asia, hosted the Governance in Healthcare: Bootcamp # 7 on January 29-31, 2019 at the Dr. Avenilo P. Aventura Hall. 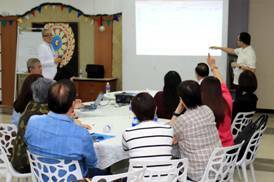 The Batch of delegates were from Amang Rodriguez Memorial Medical Center, Bicol Medical Center, Caraga Regional Hospital, Dr. Jose Fabella Memorial Hospital, Mayor Hilarion A. Ramiro Sr. Medical Center, Research Institute for Tropical Medicine, San Lorenzo Ruiz Women's Hospital, and Valenzuela Medical Center. 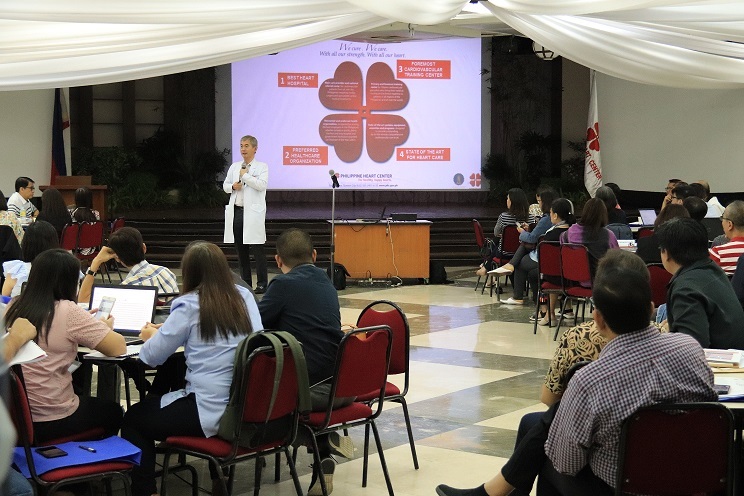 Bigger and better Philippine Heart Center can be expected for 2019 as its top and middle management took time to go over the roadmap for the hospital with the Strategy Review Session held on January 25-26, 2019 at Dr. Aventura Hall. 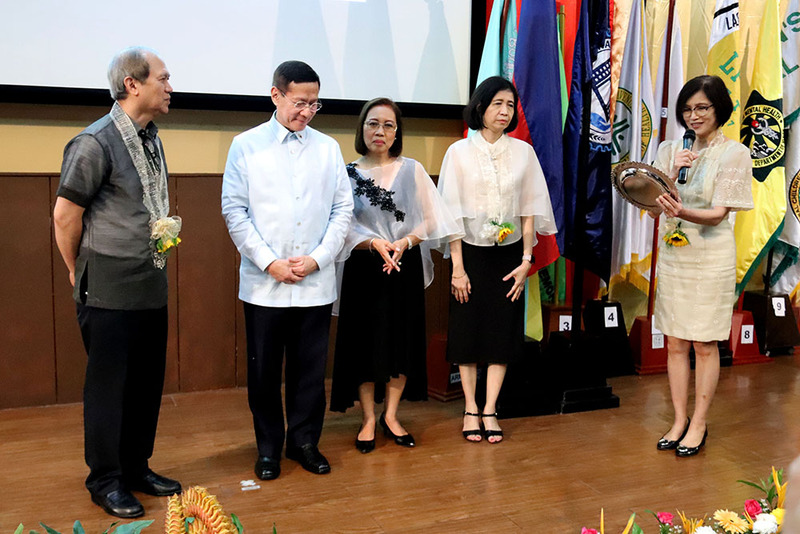 The PHC began its Christmas season celebration on December 3, 2018 with a Eucharistic Celebration in the morning and the afternoon Launching Program at 5:30 p.m. with the Lantern Parade along Matalino Street and East Avenue, followed by the Adopt-a-School Dance Contest and Boodle Fight at the Dr. Avanilo P. Aventura Hall. 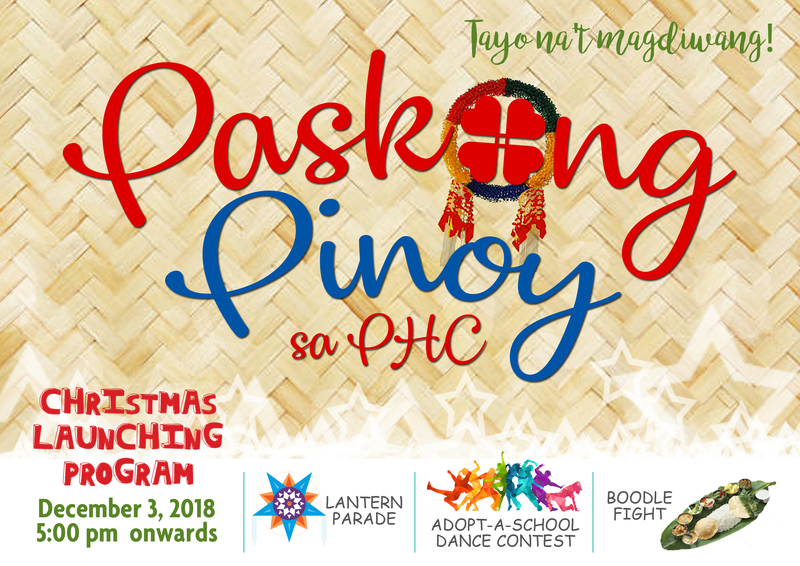 This year's theme is "Paskong Pinoy sa PHC". 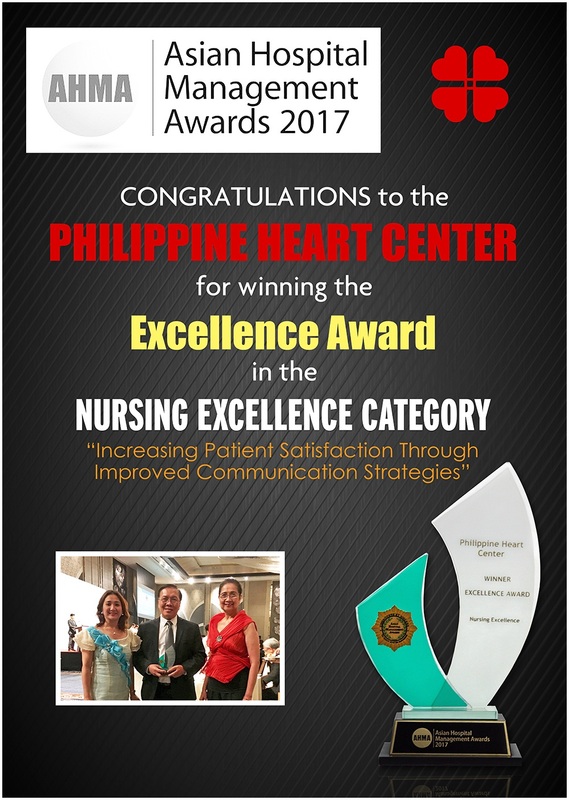 The Philippine Heart Center won second place in the National Hospital Category of the HB Search for Resilience: Huwaran sa Kahandaan para sa Ligtas na Bayan 2018, Quezon Cityâ€™s search for Tatak Kyusi Excellence in Disaster Risk Reduction and Management (DRRM) and Climate Change Adaptation (CCA), during the awards night held at the Novotel Hotel Manila, Araneta Center, Quezon City, on November 18, 2018. 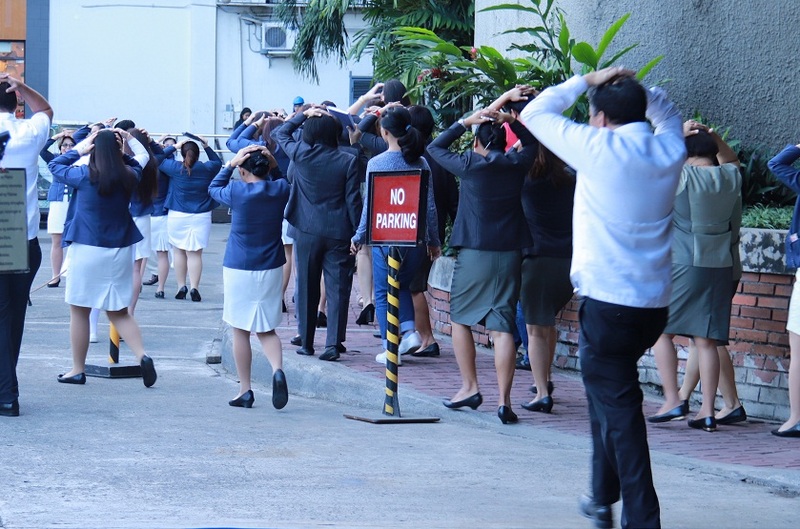 The Philippine Heart Center conducted its Earthquake Drill for the Fourth Quarter of this year on November 5, 2018. 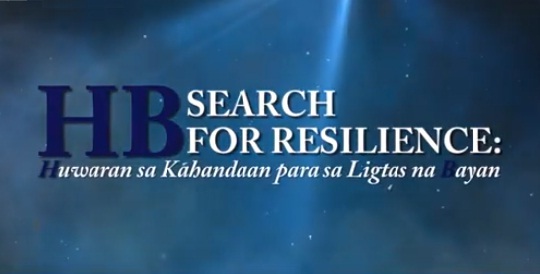 This is part of the nationwide preparation for the so-called "Big One". The Philippine Heart Center (PHC) will celebrate World Heart Day on September 28, 2018, 8:00 am to 5:00 pm, at the Dr. Avenilo P. Aventura Hall. 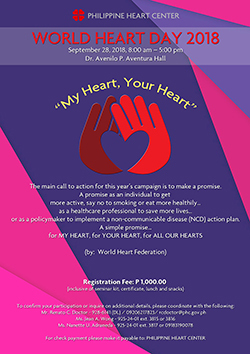 This yearâ€™s celebration with the theme "My Heart, Your Heart" is being spearheaded by the PHC Employeesâ€™ Wellness Committee as part of the Wellness Program to impart and encourage fellow workers in government on the benefits of a healthy lifestyle. 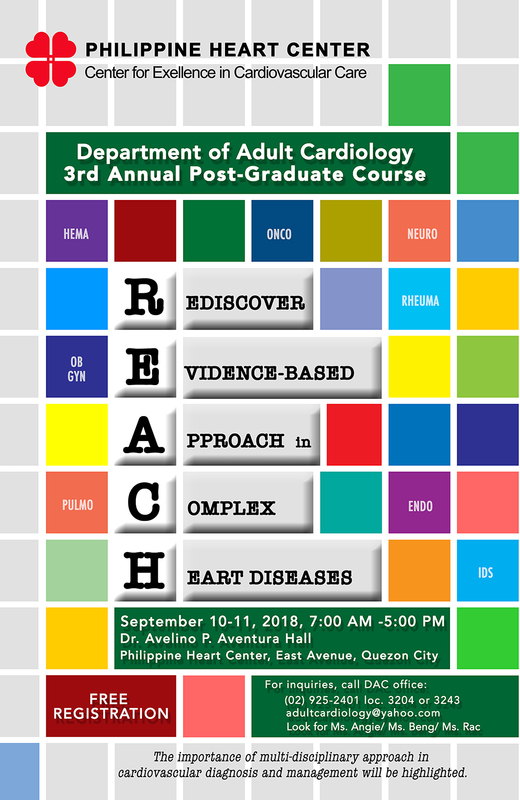 The Department of Adult Cardiology will be having its 3rd Annual Post Graduate Course with the theme: â€œREACH: Rediscover Evidence-Based Approach in Complex Heart Diseaseâ€� on September 10-11, 2018, 7:00 am to 5:00 pm at the Dr. Avenilo P. Aventura Hall, Ground Floor Medical Arts Building, Philippine Heart Center. 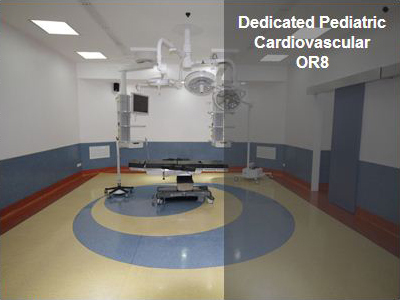 The importance of multi-disciplinary approach in cardiovascular diagnosis and management will be highlighted. 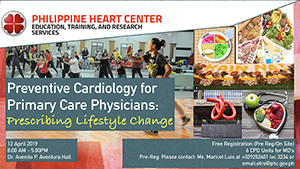 Registration for this 2-day learning activity is FREE. For more inquiries, please contact 925-2401 to 50 local 3204 or 3243 and look for Ms. Angie/Ms. Beng/Ms. Rac. 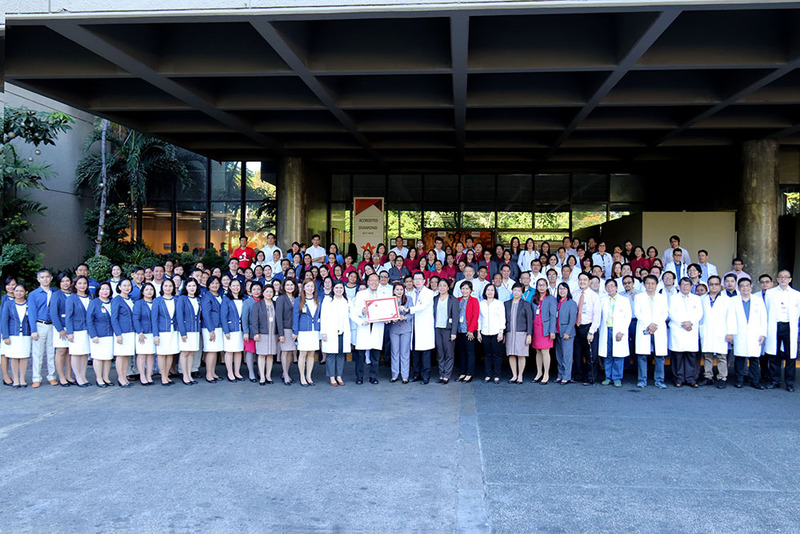 The National Hospital Week Celebration (NHWC) per Proclamation No. 181 s2003 is an annual activity to be held in the first week of August. 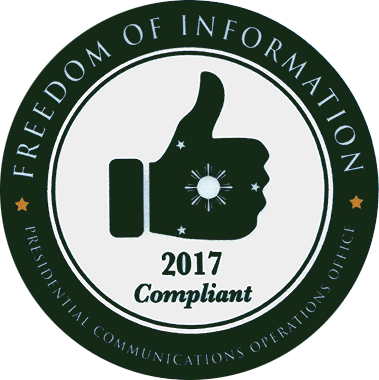 For this year, it was observed on August 6-12. 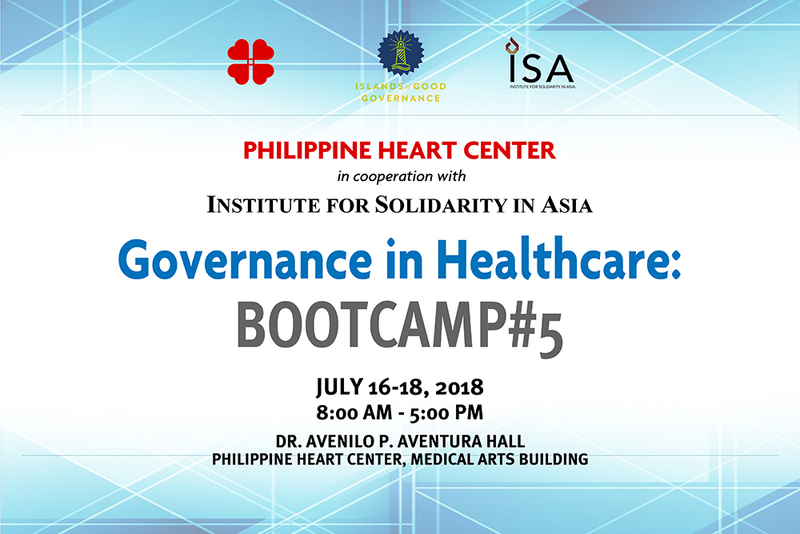 Together with the Institute of Solidarity for Asia, the Philippine Heart Center hosted the Governance in Healthcare: Bootcamp # 5 on July 16-18, 2018 at its Dr. Avenilo P. Aventura Hall. 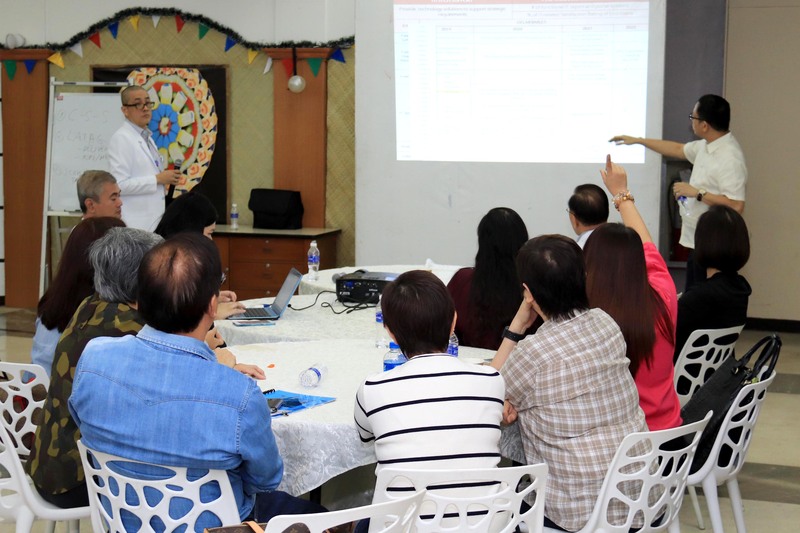 The 5th Batch of delegates were from the northern and southern regions of the country with a total of 84 delegates. 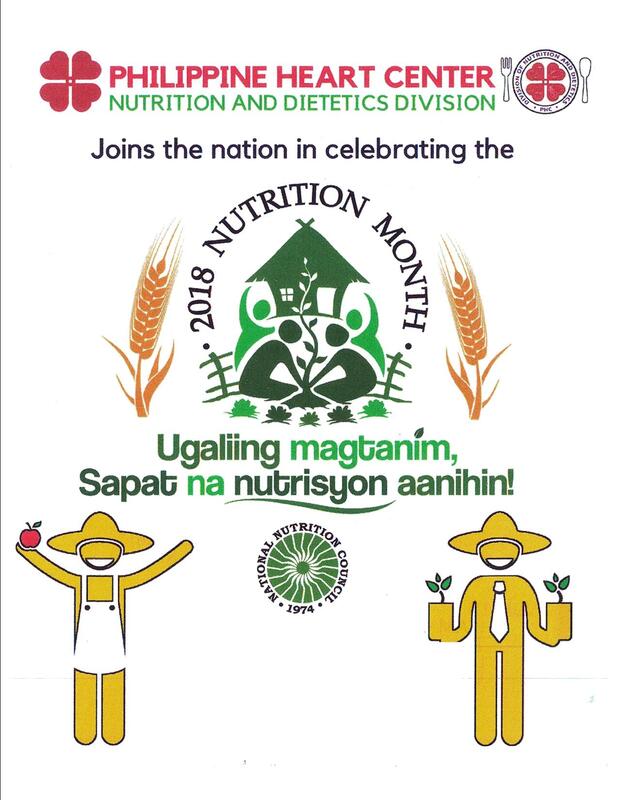 The Nutrition Month is an annual campaign held every July, as mandated by PD 491, also known as the Nutrition Act of the Philippines. 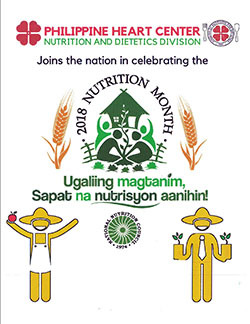 Such aims to create greater awareness among Filipinos on the importance of nutrition. 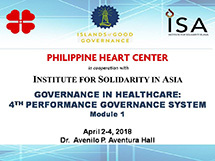 With the conferment of the "Institutionalized" and Gold Trailblazer Awards to the Philippine Heart Center upon its completion of its Performance Governance System (PGS) journey, other institutions have been inspired to walk the same path to good governance in healthcare. 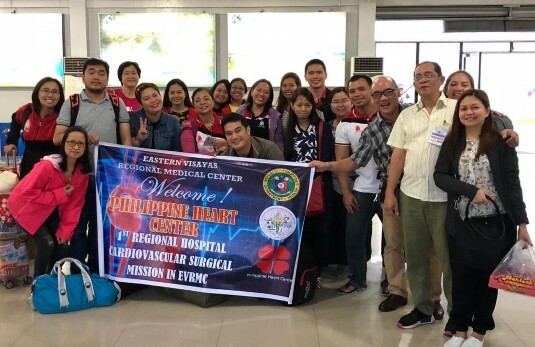 As a kick-off Regional Cardiovascular Mission for this year, once again the barriers of the lack of medical facilities and equipment for cardiac care in Eastern Visayas (Region VIII) did not hinder the Philippine Heart Center (PHC) - Eastern Visayas Regional Medical Center (EVRMC) Cardiovascular Surgical team to successfully conduct the 1st CV Surgical mission on February 24-March 2, 2018 at the Mother and Child Hospital (MCH) in Tacloban City.